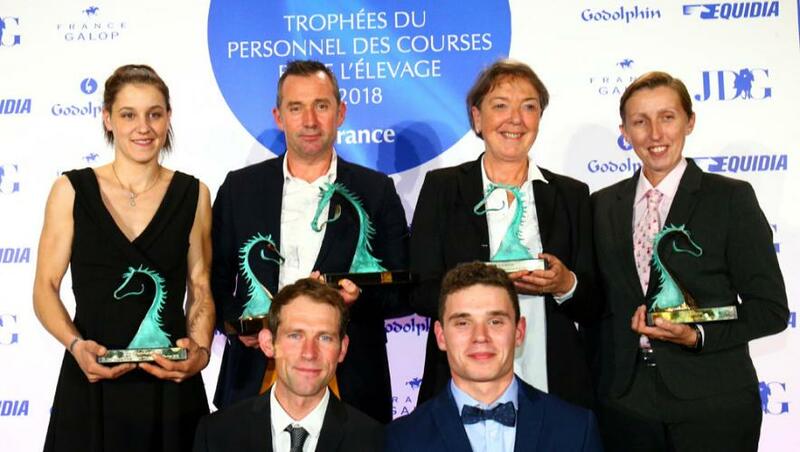 Almost a hundred nominations were received for the third edition of the Trophées du Personnel des Courses et de l’Elevage, sponsored by Godolphin and organised by France Galop. On Saturday, 24 November 2018 finalists went forward in the six categories (Rider/Groom, Administrative, Leadership, Newcomer, Dedication to Racing and Stud Staff). The nineteen members of the judging panel, presided by Veronique Verva (Equidia), announced the winners of the 2018 edition, in the presence of Diana Cooper, Godolphin’s Strategic Advisor for Charities and Lisa-Jane Graffard, Godolphin’s French representative, as well as Jean-Pierre Colombu, France Galop Vice-President. This was the first time the Awards ceremony was held at ParisLongchamp Racecourse, opened earlier this year, and it was an emotionally-charged evening, particularly at the announcement of the Employee of the Year which was awarded to Pascal Veron. The winner of the Employee of the Year prize is selected from the winners of the other categories, with the exception of Newcomer category. Surrounded by their families, friends and colleagues, the winners were recognised and rewarded for the passion and dedication with which they carry out their roles working behind the scenes in racing and breeding. A huge congratulations to all the winners and runners-up. Aude Duporté (Employed by Gianluci BIETOLINI – Nominated by Laura DELL’ELCE). Pascal Veron (Employed by Haras de Meautry – Nominated by Nick BELL). Christine Dutertre (Employed by Haras du Mezeray – Nominated by Charles Henri de MOUSSAC). Jean-François Eudes (Employed by Thomas DEMEAULTE XAVIER – Nominated by Thomas DEMEAULTE XAVIER).